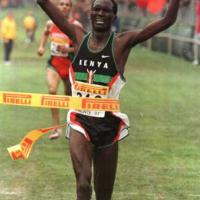 Paul Kibii Tergat (born June 17, 1969) is a Kenyan professional athlete. He held the world record in the marathon from 2003 to 2007, with a time of 2:04:55. Paul Kibii Tergat is regarded by many as one of the most astounding long distance runners of the last decade, along with his Ethiopian rival Haile Gebrselassie. Before becoming an athlete Tergat used to be a basketball player and in 1992 his exceptional career began when he won the Kenyan Cross Country Championships title. However he had to miss the World Championships through injury. Tergat has since won a record five consecutive IAAF World Cross Country titles from 1995 to 1999. On the track, Tergat won two World Championships (1997 and 1999) and two Olympic (1996 and 2000) silver medals at 10,000m on each occasion beaten by Haile Gebrselassie. Now concentrating on the marathon, Tergat is an accomplished track, cross country, and road runner. Tergat achieved one of his most wonderful victory on November 6, 2005, when he won his New York City Marathon debut in a thrilling sprint finish through Central Park, prevailing over defending champion Hendrick Ramaala 2h09'29",90 to 2h09'30",22. Tergat also won two consecutive editions of the IAAF World Half Marathon Championships in 1999 and 2000. In September 2003, he ran a superb 2:04:55 to break the Marathon World record in Berlin. At the Athens Olympic Games, he made his first Olympic appearance at the marathon and finished tenth. Paul Tergat has been married to Monica for 13 years and has three children. He has been a goodwill ambassador for the World Food Programme of the United Nations : in January 2004 Tergat was named a UN World Food Programme (WFP) "Ambassador against hunger". When he was a child, Paul Tergat's family was too impoverished to send him to school with food. Were it not for the World Food Program, which provided food at his school, he would never have gotten a full education.Tergat is also a member of the IAAF Athletes' Commission. This record has been set September 28, 2003 in Berlin, Germany. In his world record marathon race, Tergat took a wrong turn towards the end of the race. He abraded his foot so badly he later said it felt like the sole of his shoe fell off. Tergat's countryman Sammy Korir, who was employed as a pacemaker for the race, took second place. Korir ran 2h04'56", which stands as the second-fastest marathon performance in history. In addition to his successes in the Marathon, Tergat also won a record five consecutive IAAF World Cross Country Championships titles from 1995 to 1999. Tergat's further achievements include 5 victories in the traditional Saint Silvester Marathon, the most important event in Latin American street racing. He is the principal winner of all times in that race, as well as holder of the record time for the present 15 km distance, which he established in 1995. His performances in the Saint Silvester Marathon have earned him the condition of celebrity in Brazil, where he is the second most recognized African personality, second only to Nelson Mandela. He has often had to face second place, behind the great Haile Gebrselassie. In the Olympic Games 10,000 m finals of both 1996 (Atlanta) and 2000 (Sydney), the Ethiopian 'Emperor' beat Tergat by a nose after Tergat led both races into the final lap. Tergat finished second to Gebrselassie in the 1997 and 1999 World Championships in Athletics at 10,000m, and finished third in the 1995 version of that race, behind Gebrselassie and Moroccan Khalid Skah. When Tergat raced Gebrselassie in the London Marathon in 2002, it was Tergat, four years Gebrselassie's senior, who got home ahead, in second place behind then world-record holder Khalid Khannouchi. Prior to the 2004 Olympics, he had announced that the Olympic Marathon would be his last race representing Kenya, although he would continue to compete as an individual. In the Athens marathon, he missed his water point and drank water supplied by organizers. He is accustomed to drinking water at room temperatures, while the organizers supplied cold water. This resulted in cramps. Tergat finished 10th in the Marathon at the 2004 Athens Olympics. He still cherishes a hope of competing in 2008 Olympics. However, he will not compete in World Championships any more.